Whenever you bend your torso to one side or rotate your upper body, you're activating your external obliques. These muscles, which extend along the sides of your torso, are superficial muscles that cover the internal obliques. Strengthening these muscles helps to tone your waist and to give you a stronger core — the region including your abs, obliques and lower back — which help support your spine. Perform exercises such as side bends, side crunches, Russian twists and bicycle crunches. Side bends can be performed myriad ways, whether with dumbbells, weight plates, cables or even a jug of water if you're working out at home without any equipment. The basic technique is the same, however, no matter what you're holding. Stand with your legs together and spine erect, holding a dumbbell (or substitute weight) in your right hand. On an inhale, bend your torso to over to the right, keeping your body in one plane until you feel a good stretch along your left side. Exhale as you come back up to center. Repeat for 10 to 20 repetitions, then switch the weight to the other hand. Keep your core muscles — abs, obliques and lower back — contracted throughout the exercises. This will help you lift heavier weight and protect your back and obliques from injury. Don't bend to the point that your feel pain on the extended oblique. Bend only far enough to feel a gentle stretch. Don't collapse through the torso. Lengthen up and then bend, as if bending your torso over a beach ball. Use a slow, controlled motion throughout the exercise. Side crunches are very similar to regular crunches, but they're performed with a rotated torso to put the force on the obliques. Lie on your back on an exercise mat with your knees bent and your feet flat on the floor. Drop both knees over to the right side as far as they will go without your left shoulder blade lifting up off the mat. Place your hands behind your head for support. Exhale as you lift your shoulder blades and upper back up off the mat. Rise up as far as you can without straining your neck. Repeat for a total of 10 to 20 reps, then switch sides. Avoid crunching your neck. Don't pull your head up with your hands; rest the fingertips gently on the back of the head and keep the neck long. Use a slow and controlled motion throughout the exercise. Keep your knees stacked on top of each other and don't allow them to come up as you raise your torso. Russian twists can be performed with just your own body weight or while holding a dumbbell, weight plate or medicine ball. It's an effective exercise that works the entire core, but targets the obliques. Sit on an exercise mat with your knees bent and your feet flat on the floor. Lean your torso back to about 45 degrees and lift your feet up off the mat so your lower legs are parallel to the floor. Extend your arms out in front of you, palms pressed together. As you inhale, rotate your torso to the right. Pause for a moment, then exhale as you rotate back through to center. Inhale as you rotate to the left, then exhale back to center. Repeat for 10 to 20 reps on each side. Move in a slow and controlled motion. Once you can perform 20 reps easily, you're ready to add weight. Simply hold a dumbbell, weight plat or medicine ball in your outstretched arms and perform the steps outlined above. Start with a light weight and add pounds as your strength increases. 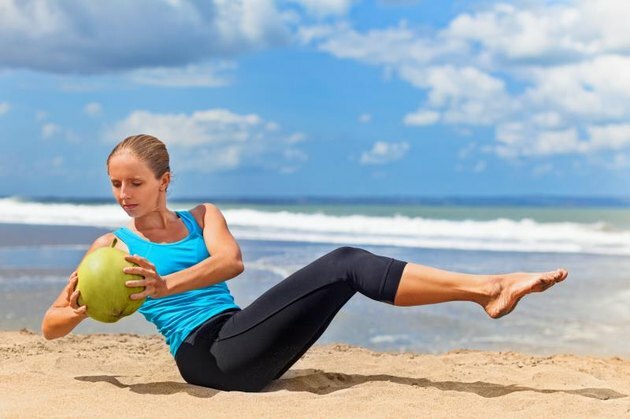 A simple exercise that requires no equipment, bicycle crunches are an effective exercise for targeting the obliques as well as the abdominal muscles. Lie on your back on an exercise mat. Place your hands behind your head for support. Lift your shoulder blades and upper back off the mat. Keep them lifted throughout the exercise. Pull both knees in toward your chest so your knees and hips are at 90-degree angles. Exhale as you rotate your torso to the right, bringing your left elbow to your right knee. As you do this, extend your left leg out, hovering your foot a few inches above the mat. Inhale as you come back through center, then exhale as you twist to the left, drawing your left knee in to touch your right elbow and extending your right leg long. Repeat for 10 to 20 repetitions on each side. Keep your core contracted throughout the exercise. Maintain contact between your lower back and the mat throughout the exercise. This protects your lower back from strain. Don't crunch your neck or pull on your head with your hands. Rest your fingertips lightly on the back of your head and keep your neck long.